We live in a tiny apartment in Hong Kong. 200 square feet, maybe less. A box, perched 26 storeys above one of Kowloon’s sleazier districts. A box, busting at its seams as tapes, cameras, editing equipment, dirty laundry… our lives, threaten to spill out onto the communal lift landing just outside our door. We edit our films in here, review our tapes in here, watch TV, chill, argue over creative ideas, fight and try to make up… in here. Navigating such a small space can be a challenge. There are always limbs to climb over, stray wires to avoid, frayed nerves to overcome. It is almost impossible to have visitors, and we’ve given up trying to cook in the cupboard we call our kitchen. Most days though, we try not to grouse. A box is a prized commodity in inner-city Kowloon. They’re not cheap, and many are definitely not nearly nice as the one we have. Plus, ours is only a temporary arrangement – it ends when our shoot finishes More importantly, in the crazy world of Hong Kong-style boxes, ours is considered spacious. Truth be told, we’re actually a little bit embarrassed about our box. We’ve had to talk down its size, deflate the rent a little, so that the people we hang out with – members of the homeless football team – won’t feel like we’re living it up. 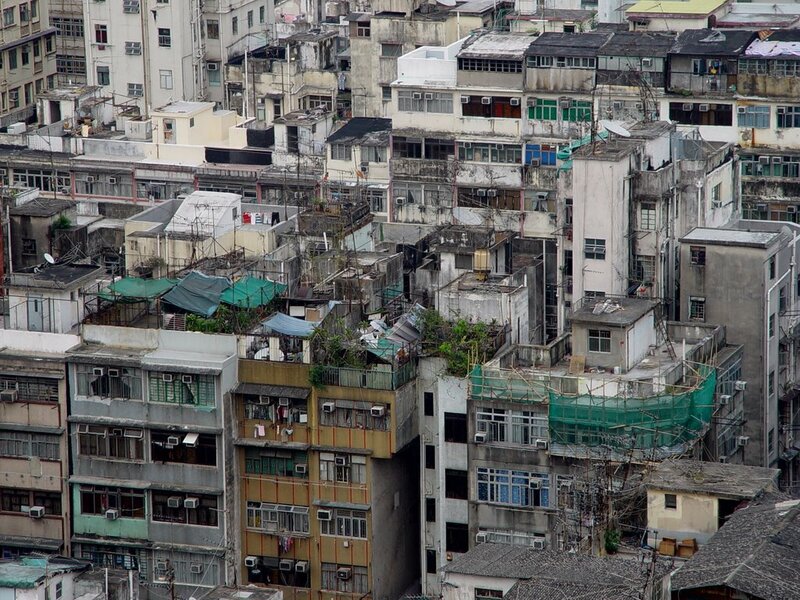 Shamshuipo is a warren of dingy boxes buried deep inside lightless, airless, joyless buildings. Regular flats, partitioned several times over. Rows of doors and tiny tiny corridors. 15, 20 people inside a space built for five. The nicer boxes can hold more than just a bunk bed. Some lucky tenants manage to squeeze in a couple of chairs, a TV, even a stove. Rooms with a view cost slightly more than a windowless unit. An attached bathroom is a luxury. Even the most basic boxes cost at least a thousand Hong Kong dollars a month to rent. For many of the players on the football team, that’s a substantial chunk of their monthly pay. Small wonder then that some prefer to sleep on the streets. Out, under the stars, where the air is fresher, the public loos easily accessible. Out, where space is free.